I’ve heard several mothers talk about how their baby was fine at the hospital, that their problems didn’t begin until they got home. Our experience didn’t happen like that. From the very first day my son Israel, wouldn’t sleep, but instead screamed and cried constantly. Nothing seemed to soothe him. Our last night at the hospital, we asked the nursery to take him, so we could get some sleep. 15 minutes later they brought him back saying he was kicked out of the nursery, because he cried too much. Our first night home was spent nervously watching our baby boy projectile vomit, scream and cry. For months Israel would scream and cry and vomit for hours on end. In fact he would cry so hard he would lose his voice. He took only small naps, the most being 45 minutes. He would have diarrhea so badly that he would keep yeast infections on his skin. He would have odd rashes and dry patches of skin. After two pediatricians and trials of cows milk formulas and soy formula. The doctor then switched him to Nutramigen and scheduled an upper GI. The upper GI confirmed reflux and he was then put on Prevacid. The Nutramigen and Prevacid really seemed to do the trick. He was still a little fussy and spit up quite a lot. But the doctor wasn’t concerned and felt we shouldn’t be either. But being his mother, I just couldn’t let it go. He could drink water and hold it down, but his formula he would spit up. I knew he could do better. After a few weeks of research I found out about Neocate. I had read so many testimonials about how Neocate and Prevacid stopped the food allergy reactions and reflux issues. Could it be true? His pediatrician thought the problem was reflux, lactose intolerance and classic “Colic”. And that I simply worried too much. Finally after several visits he agreed to send my son (6 months old) for an allergy test. He tested positive for Milk, Soy, Corn, Pork, Peanuts, Apples, and Rice and positive for some other intolerances. FINALLY I had my proof!!! The allergy specialist gave me a prescription for Neocate and I rushed it to the pharmacy as quickly as possible. That afternoon we gave him his first bottle of Neocate. He took the bottle and guzzled it down. We watched and waited, and to our surprise no spitting up! We realized not only had the other formula’s been causing spit up but also had made him irritable. He started gaining weight, sleeping through the night and generally acting satisfied within a week of being on Neocate. Now he is happy, healthy and full of energy! 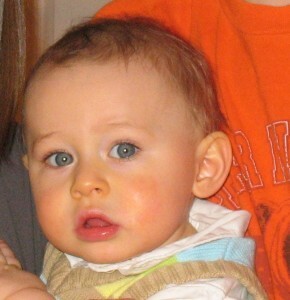 He just turned one year old in December 2010 and now we are starting on Neocate Jr. As a mother, I couldn’t be happier! Our post today is a guest blog entry from Karen Adams, Israel’s mom. We’d like to thank her for guest blogging for us. Update on 8/4/11: Karen provided an update that Israel is still allergic to milk. They’ve transitioned to Neocate Junior and it is helping him continue to grow and thrive!